Apart from modern medicine, the Committee was also requested to examine and suggest improvements to be made in other traditional systems of Indian Medicine viz. Siddha, Ayurveda and Unani. The intension was that the Medical University to be established in Tamil Nadu should bring about co-ordination between various educational and training institutions of modern medicine as well as other Indian Systems of Medicine, Dentistry, Nursing, Pharmacy, etc. and promote research. Based on the report of the Committee, the Medical University was established by the Government of Tamil Nadu. The Tamil Nadu Medical University Act, 1987 (Act No.37 of 1987) received the assent of the President of India on 24th September, 1987. By an Act No. 39 of 1991, it was amended that the Act may be called "The Tamil Nadu Dr. M.G.R. Medical University, Chennai, Act, 1987. 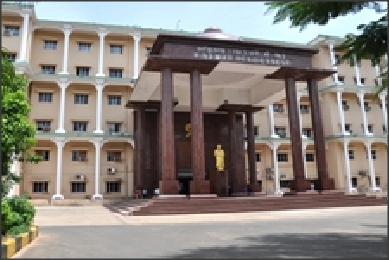 This affiliating University governed by the said Act started functioning from July 1988. The Students admitted to the various Medical and Paramedical courses after 1.3.1988 come under this Medical University as per Government notification issued in G.O.Ms.No.1628/Health, Indian Medicine and Homeopathy and Family Welfare Department dated 23.08.1988.